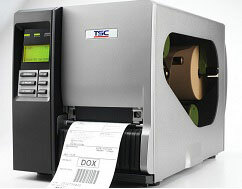 Offering 300 dpi resolution, the TSC TTP-344M Plus die-cast aluminum barcode printer is designed to meet the most demanding bar-coding and identification needs at an affordable price. The TTP-344M Plus features a user-friendly 6-button display and side-load design, standard serial, parallel and USB connectivity, and optional Ethernet networking for simple integration with other devices. The TTP-344M Plus operates at speeds up to 6 ips, prints up to 4 inches wide and accommodates a 600-meter-long ribbon, while offering 4 MB of Flash memory and 8 MB of SDRAM. Printer, Thermal transfer, 300 DPI, 6 ips, Metal Industrial, 8 inch outer diameter Medaia, USB, Serial, Parallel, Includes US Power Cable, USB Cable and Bar Tender CD.